Join the discussion on our forums! Come discuss Rumbletusk Shaker over in our dedicated Rumbletusk Shaker discussion topic. Deathrattle: Summon a 3/2 Rumbletusk Breaker. Rub a dub dub, three trolls in a tub. And who do you think dey be? Da Shaker, Da Breaker, and Da Undatakah. And all of dem comin' for me. Undervalued for a deathrattle minion. Maybe both should had a rush, a taunt or at least +1 health. Any idea what the hell Rumbletusk Breaker say when he gets summoned? Put me in, mon! It's my turn! I hope people realize that this is a better dreadsteed. this is probably going to be meta defining. Really good in warlock. Their real names are Ricky and Bobby. Maybe for deck that actually need it's minions to stick for a turn or two? For a quick little second I thought that they've made a better version of a Dreadsteed for all classes. 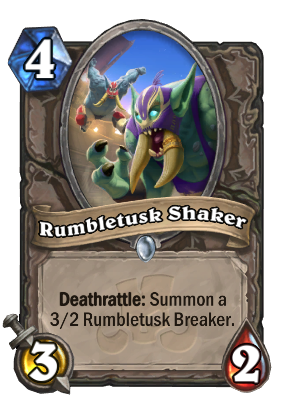 Due to all the trolls in the set, wouldn’t a Rumble Tuskbreaker be more intimidating to them? Can’t this go on any longer?